For cyclists, Le véloroute « la voie des Vignes »(the Cycleroute « The route of the vines ») which goes from Beaune to Santenay, passes just beside Monthelie. 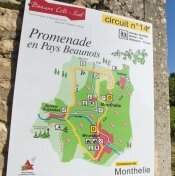 For those who love walking, there are several possible rambles starting from Monthelie. Monthelie - Volnay – Pommard: in the middle of the vineyards, with magnificent views of the plateau. About 8 kms, duration 2 hours. Monthelie - Meursault - Auxey Duresses: a varied circuit, through forest, vineyards and villages. 11,5kms, duration 3 hours 30 minutes. You can leave as well in the direction of Saint-Romain, Orches and Evelle or also towards Nantoux.  Promenade en pays Beaunois 2006 (Walk in the Beaune Countryside 2006) - (in French or English).  Couverture Circuit Sud & Circuit Nord, in the section on Circuit Nord, the path N°14 Sentiers des Buis, which passes by Monthelie, is described.